The album opens with some drifting vocals and strings that lead into second single Animal Army, and then suddenly we’re thrown into roaring guitars that give this a perfect heavy rock start. Sadly, Jas Mann‘s vocals here are difficult to hear and a bit flat at times in the verses. Occasionally he sounds like he’s trying to emulate the vocal style of Liam Gallagher or Ian Brown. An edit of this track reached #17 in the UK singles chart. Lead single Spaceman is up next. This was catapulted to the top of the UK singles chart, where it stayed for 5 weeks in 1996. This was greatly aided by Levi Jeans using an edit of the song in their advertising campaign. The song slowly builds up with heavy use of electronic sound effects before Jas’ vocals take some serious pitch/speed effects. A chugging, dark, guitar section takes the verses with Jas’ lower vocal tone – and his vocals sound perfectly at home here. This contrast helps to give the song a slightly other-world feel. It was quite rightly the lead, and hit, single. Up next is Zodiac Sign, which is a slower track, but no less gentle. It starts off, and often drops back, to a more gentle wandering guitar, vocals, and light percussion, pierced by those roaring guitars again. Most of the time, I can’t hear or make out what’s being sung, but musically it’s a nice song. Morse code and robotic vocals open fourth track Paris Green. Again, this is a slower track, and thankfully here it’s easy to make out what’s being sung. This is quite a nice track, although you can pick out a semi-formulaic pattern in the songs by now. Quiet. Roaring guitar. Quiet. Roaring guitar. Weird bit. Roaring guitar. End. Confused Art seems to have great pace at the start, before drifting into a kind Baggy/drifting verse. It’s clear here that these guys knew, the Happy Mondays and Stone Roses. This song kind of just chugs along, and has little more to offer. This follows with next song Caffeine, which does little to build upon what’s already happened by the time you get to this sixth track. At least in this track though, there’s a point in the verses where Jas sounds like he’s trying to make a Garbage record. Up next is the third single, and title track, The Boy With The X-Ray Eyes, which opens with some nice swirling synths, then piano and strings, but Jas’ vocals are not quite up to the job. The song then gets into full swing, and set against the snarling guitars, and fast pace, Jas’ vocals feel much better suited. This was the final song to be lifted from this album. The single peaked at #32 in the UK. Next up is Don’t Feed The Animals – the shortest track at 1m 38. It starts with a fade out, before switching to a gentle fade in of some Indian-styled acoustic and percussive music, whilst Jas sings softly over it and a few animal samples, and for a moment you can almost hear Cypress Hill‘s Insane In The Brain. Ninth track Fire Guided Light, feels like the music from Spaceman with some different vocals laid over the top. You can even sing part of the latter song over the top and it fits well. Once i’d spotted this, I found it hard to hear anything else. Penultimate song Is Your Soul For Sale? opens as a piano ballad, with some drifting synths and guitars joining Jas’ vocals. Occasional string stabs interrupt pace, signalling the song to start build. Jas begins singing about ‘London town is burning‘ and at this point he’s sounding slightly David Bowie-like. This song lacks the snarling guitars, and the sleeve notes reveal that this was solely produced by Jas. Maybe it was just him, alone in a studio? The album closes with I’m Cracking Up I Need A Pill which starts with a couple of crazied chants of the song’s title, before returning to the it-worked-for-Spaceman-let’s-do-it-again formula. This then drops out for some quiet verses, which work well in contrast, but this song doesn’t stray far enough from the formula to give an interesting ending. Just like the songs, on the artwork it’s also a bit difficult to make out the words. Definitely sack the designer, get the guitarist back, and sort out the vocal levels next time (if ever there is one). Even when you do work out the lyrics, they’re pretty much all protest songs – which makes me wonder whether Jas would actually be better off going into space, man. If it hadn’t have been for a pair of jeans, I doubt we’d have ever heard of them. Where are Babylon Zoo now? Babylon Zoo failed to repeat the commercial success of their debut single, and underwent scathing live reviews. They did manage to release second album King Kong Groover in 1999 but this did not repeat the same commercial success. 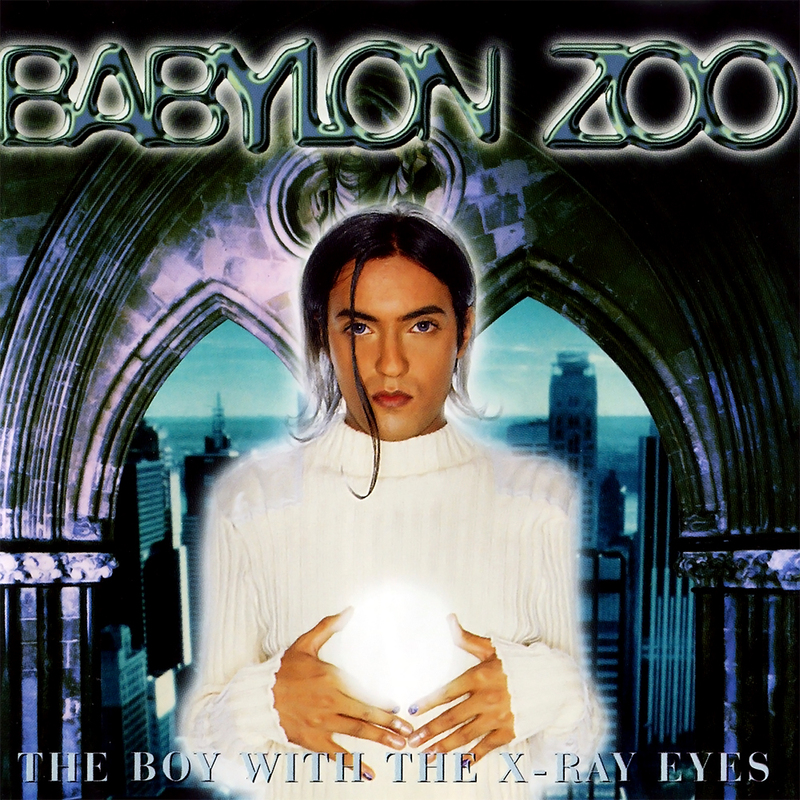 Essentially Babylon Zoo finished ended in 1999, although frontman Jas Man announced a third album in 2005, but this has yet to materialise. He appears to have moved to India and taken work as an aid agency worker. POP RESCUE COST: £2.88 from an eBay seller. Posted in 1990s, Babylon ZooTagged 1996, album, Animal Army, Jas Mann, Levi's, review, Spaceman, The Boy With The X-Ray EyesBookmark the permalink.